An evening of poetry readings featuring current writer in residence Earl Livings and a sound performance by sound artist in residence Lee Berwick. Local poets and writers Eileen Harrison, Helen Pugh, Tina Warren, Mike Smith and Heather Williams will also be reading. For most of Earl’s life he has been fascinated by what has been called The Matter of Britain, though he did not know this term at the time of his initial interest. Earl is part Welsh and has felt the pull of the ‘Celtic fringe’ for all that time. He prefers Irish and Anglo-Welsh poets and others working in imaginative/mythic traditions. He has become particularly attracted to the Merlin mythos, both in its connection with the Arthurian mythos and in its own historical setting. Thus, when Earl had the opportunity in 2013 to come to the UK for a conference on the sacred in arts and literature, he decided to stay afterwards and conduct research for a novel on the historical Merlin. He explored sites of mythic or historical significance to the Merlin story in Wales and Scotland. He then went back to Australia and wrote the first draft of the novel. Of course, as most serious writers know, writing is re-writing, and it was when he started the redrafting and conducted more research that he realised there was still much to know about the story he was trying to write. Then came the chance for a residency at Stiwdio Maelor. Earl applied and was accepted for an eight-week stay. He has been here since early March and has made some progress on the next draft of his novel, and he plans to research sites he missed last time. Earl has also found himself writing new poems, some of them from drafts written in Australia or during his previous visit to Britain and some from experiences during this visit. He is in the home of the bards and thrilled by the immersion in landscape and language (he is studying Welsh while he is here). It is not only helping him with the novel but also inspiring poetic responses to his encounters with the Celtic soul. For the last few weeks Lee has been working with story teller Mikael Oberg making a version of the INANNA myth (Its the oldest known written story in the world). Mikael and Lee have performed several times recently with Mikael telling and Lee making a live sound world to go along with the story. They recorded the voice separately at one of the recent shows and Lee will create a live sound piece to accompany this recording of Mikael recounting the story. Eileen has written poetry for some years, with work published in anthologies such as Her Mind’s Eye by Pyramid Press. Her public readings, performed in the spoken and sung voice in venues such as Aberystwyth Arts Centre and the Willow Gallery, Oswestry, are a development of the sound tracks which she introduced into her installations in stitch, sound and word. A major theme is that of conflict, in which she draws on her experiences of the Troubles in Northern Ireland to write about the violence which humans continue to inflict on one another. The thread of sea and shore also runs strongly through her work and she reflects often on nature, ecology and the spirit. Eileen received an Arts Council of Wales award to develop the words and music for an installation, Vigil and, this component now realised, she will complete the work with stitched hangings and illustrated book in poetry and prose. Married with two grown-up children, Eileen pursues a part-time PhD in Fine Art at the School of Art, Aberystwyth University, while continuing to work as a professional artist, exhibiting regularly in Wales and beyond. She lives in Dolgellau with her husband and cat. Helen lives in Tywyn and is both an artist and poet. She will read two poems – The Map and Bluebell. Helen spends most of her days out with her sketchbook collecting ‘marks’. She makes drawings in response to what is seen as well as to those things heard and sensed. Thoughts also find their way onto the page and often the gestured mark can be mistaken for words. This information gathering then becomes the ‘stuff’ of further works in which she deems certain marks significant, isolating and relocating them. 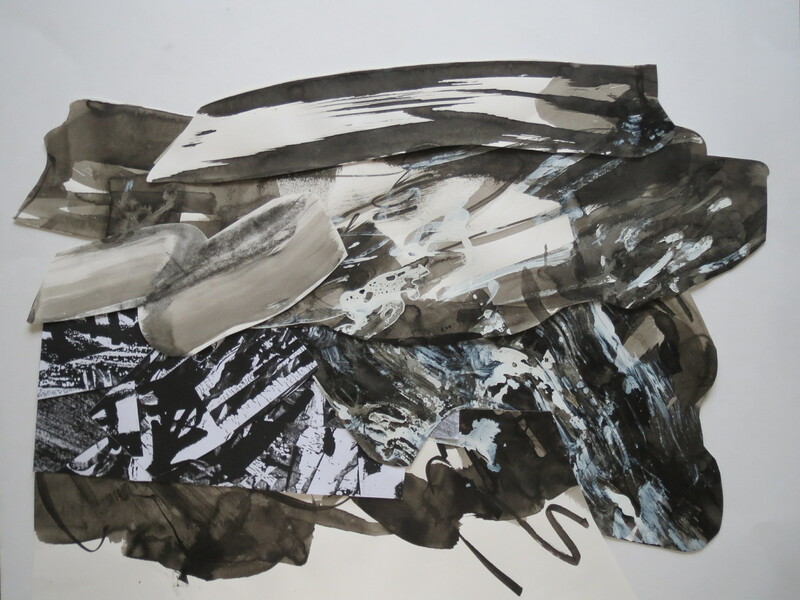 Helen’s picturing emerges from the resultant collages, grows out of the process of continually taking things apart and putting them back together again. 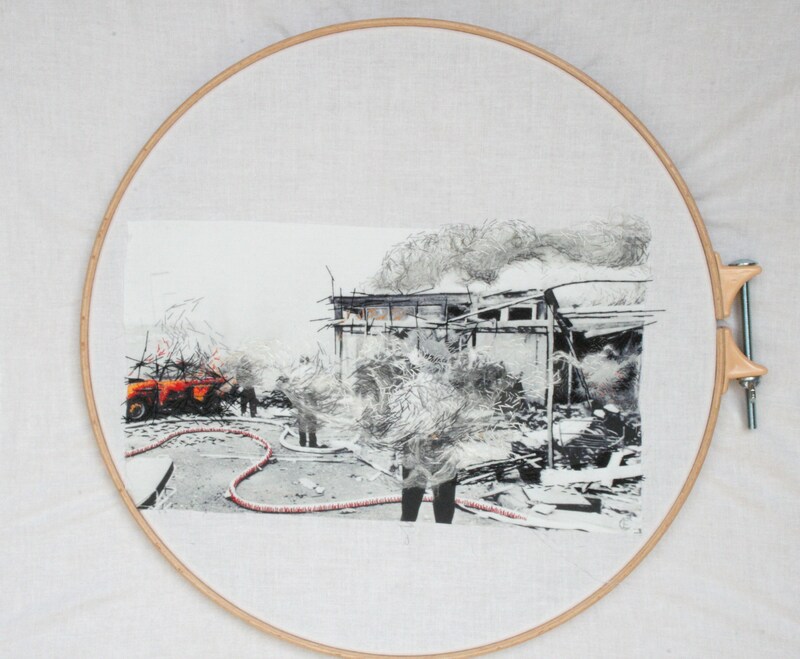 Helen has a degree in Embroidery and her drawings reflect a stitch sensibility. Tina lives in Aberllefenni, 2 miles from Corris and is a founding member of The Word Distillery who meet at The Arts Centre Aberystwyth. She has read on a number of occasions at The Poetry Café in Covent Garden. She is currently writing a collection of poems based upon the life of her mother from China. Tina’s work explores the ambiguity of identity. Her poems are a testament to the human spirit that is able to overcome socio-political repression. Compressed into economical lines, her stanzas examine the roles of women and the dark side of domesticity. As a writer, she breaks many of the old taboos, dealing directly with the estrangement and isolation felt by those of mixed race whose hearts are torn between two cultures, though never quite belong in either. Tina will be reading poetry, including a couple of poems from other members of the group. Heather believes that poetry writing is self centred and hers could be esoteric existentialism. Heather’s history would be traced through from those days as an art student in the late 60’s drug culture of squats and overland adventures to Afghanistan, to becoming a Tai Chi Instructor, meditation teacher and therapist. After 25 years of which, she is now living in Aberystwyth with her husband and dog and surrounded by family. A member of the Word Distillery and co ordinator of the regular Wednesday poetry group at the Art Centre and having lived in Wales since 1976 the landscape is a constant inspiration, especially the sea and the human beings sharing the planet. Heather is not highly motivated to publish but have had a few pieces in Earlyworks/ Womens words/Aberystwyth MA Anthology and have read with the Highgate poets and at the Poetry Café. Life is work in progress.